Director – Dave Filoni, Screenplay – Henry Gilroy, Steven Melching & Scott Murphy, Story – George Lucas, Producer – Catherine Winder, Music – Kevin Kiner, Based on Themes by John Williams, Animation Supervisors – Kevin Jong & Jesse Yeh, Animation – CGCG Inc. Production Company – Lucasfilm Animation. Anakin Skywalker and Obi-wan Kenobi are in the midst of a fierce battle against droid armies of Count Dooku on the planet Christophsis. They are joined by the precocious young Jedi apprentice Aksoka Tano who insists that she has been assigned as a padawan to Anakin. Anakin insists that he does not want an apprentice but soon grows to an appreciation of Ahsoka’s impulsive methods. At the same time, Jabba the Hutt’s son Rotta has been kidnapped and Jabba is pressing the Jedi to become involved in the search. Sensing that everything is not as it seems, The Jedi agree, seeing that whoever wins Jabba’s favour will earn access to the Outer Rim hyperlanes that Jabba controls. Anakin and Ahsoka head to the jungle planet Teth in search of Rotta. Jabba has also requested that Count Dooku become involved in the search. However, Count Dooku is involved in the kidnapping and is seeking to have the Jedi blamed for it. I am old enough to have grown up with the first generation of Star Wars fandom. There was a time when Star Wars (1977) and its immediate sequels, The Empire Strikes Back (1980) and Return of the Jedi (1983), were the most exciting things on the planet – the very best, the most cutting edge and most anticipated that science-fiction had to offer. After Return of the Jedi, First Generation Star Wars fandom faded away to a long wait for something that seemed like it would never happen. In the mid-1990s, George Lucas started merchandising everything he could out of the Star Wars phenomenon and it felt sad sitting watching one’s childhood being sold away as another brand name. Lucas eventually returned to the Star Wars universe with his prequel trilogy Star Wars Episode I: The Phantom Menace (1999), Star Wars Episode II: Attack of the Clones (2002) and Star Wars Episode III: Revenge of the Sith (2005), which emerged to universal indifference, especially from the people who had grown up on the original trilogy. The excitement of the originals had become swallowed up by bad dialogue, wooden leads and an obsession with visual effects that took over the show to the exclusion of almost all else. George Lucas finally showed us how Anakin Skywalker became Darth Vader in Revenge of the Sith and it seemed that that would be the last we would hear from the Star Wars universe. However in 2006, Lucas announced he would be bringing Star Wars to television as an animated tv series Star Wars: The Clone Wars (2008-14). This appears to be a remake of another animated tv series Star Wars: The Clone Wars (2003-5), which consisted of three seasons of five minute episodes (25 episodes in all) that aired on the US Cartoon Network. 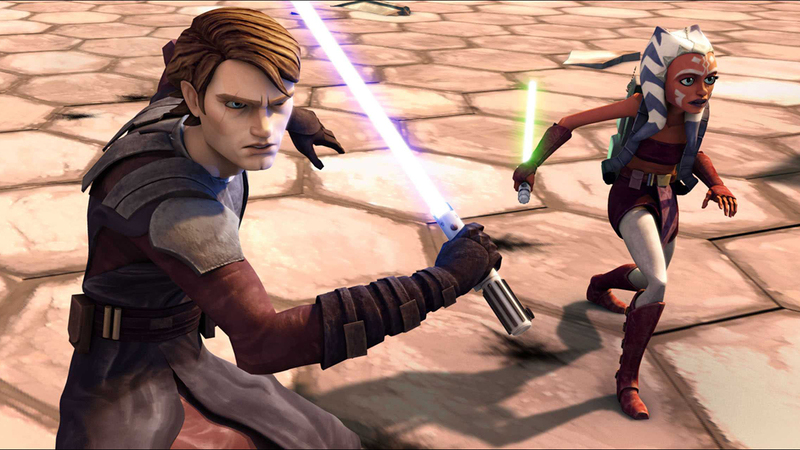 The new Clone Wars series then morphed into this animated film, which was released as an advance rider to gather interest for the new tv series. In terms of the Star Wars universe’s internal chronology The Clone Wars would appear to sit somewhere between the events of Attack of the Clones and Revenge of the Sith. The Clone Wars received a good many Star Wars Lite-type reviews. The truth though is that Star Wars has been lite ever since George Lucas started on the prequels. Indeed, the prequels became so obsessed with cutting edge computer-generated effects technology at the expense of the human element that the only real difference between watching The Clone Wars and one of the prequels is that there are no live-action actors here. The main problem with watching Star Wars: The Clone Wars is that one has seen enough of the Star Wars universe that by now it has become overly familiar. In the 1980s, watching the X-Wing attack on the Death Star, the battle with Walkers on Hoth, the Millennium Falcon dodging around an asteroid belt or Luke Skywalker and Darth Vader in a lightsabre duel was something completely exhilarating. By the time of the prequels, there seemed to be a noticeable strain on George Lucas’s part to keep coming up with new variations. Certainly, Lucas did do so a handful of times – the pod race in The Phantom Menace, the Obi-wan/Anakin duel in Revenge of the Sith – but mostly what we ended up seeing was seeing the basics upped in a desire to find novelty – one opponent with two lightsabres, one Jedi vs two opponents, a four-armed robot wielding lightsabres etc. By the time of Star Wars: The Clone Wars, we get the basics all over again – lightsabre duels, flotillas of small tiny ships engaged in combat, battle droids, vast war machines in combat. The very problem with The Clone Wars is that the Star Wars universe is seeming tired. Certainly, had one not seen the prequels, you could commend Dave Filoni for making a film that moves with an undeniable vigour and moments of epic scope. It is just that what we have is the same thing that we have seen through six movies with minimal variation. To stop the Star Wars universe turning stale, George Lucas needs to start coming up with some original moves. Certainly, take away the action scenes here and the story that we have is slim to scanty. I have reached the point, sadly to report, especially considering that Star Wars was such an essential part of my childhood, where I have grown tired of the Star Wars universe. There is simply not enough complexity and depth beyond the flashy visual effects to make it a place that one wants to keep coming back to – not something you could say of the Star Trek and Doctor Who universe or other shows like Babylon 5 (1993-8). Time is well overdue that George Lucas move beyond constantly recycling something that was successful three decades ago and show that he has some other kind of song that he can sing.